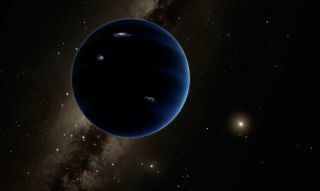 The mythical "Planet X" may actually be real, and scientists are calling it "Planet Nine." This potential "Planet Nine" has not yet been observed. But Brown and his colleague, Konstantin Batygin, also of Caltech, are inferring its likely existence based on modeling work and the weird orbits of a number of small objects in the faraway Kuiper Belt, which lies beyond Neptune. "Basically, it shouldn't happen randomly," Brown said. "So we thought something else must be shaping these orbits." A planet with 10 times the mass of Earth may be orbiting the sun beyond Neptune. This image shows the theorized orbit of the giant planet and six other solar system objects beyond Neptune. Brown and Batygin considered the possibility that other relatively small KBOs might be shaping the orbits. But the duo's calculations suggested that, for this to work, the Kuiper Belt would have to harbor about 100 times more mass than it's thought to possess. So they moved onto another possibility — a big, undiscovered planet out in the solar system's frigid outer reaches. This is not such a wild or unprecedented idea; in the past few years, other researchers have suggested that a mysterious, massive Planet X could be responsible for the surprising orbits of newfound Kuiper Belt objects. "We plotted up the positions of those objects and their orbits, and they matched the simulations exactly. When we found that, my jaw sort of hit the floor," Brown said. "When the simulation aligned the distant Kuiper Belt objects and created objects like Sedna, we thought this is kind of awesome — you kill two birds with one stone," Batygin said in the same statement. "But with the existence of the planet also explaining these perpendicular orbits, not only do you kill two birds, you also take down a bird that you didn't realize was sitting in a nearby tree." Caltech professor Mike Brown and assistant professor Konstanin Batygin worked together to predict the existence of "Planet Nine," a massive body orbiting the sun beyond Neptune. "One of the most startling discoveries about other planetary systems has been that the most common type of planet out there has a mass between that of Earth and that of Neptune," Batygin said. "Until now, we've thought that the solar system was lacking in this most common type of planet. Maybe we're more normal after all." Brown and other observational astronomers (Batygin is a theorist) are now searching for Planet Nine. The planet's orbit has been mapped out, but its exact location is not known. Still, Brown said, many telescopes on Earth have a good shot at spotting the planet, if it exists. "I would love to find it," Brown said. "But I'd also be perfectly happy if someone else found it. That is why we're publishing this paper. We hope that other people are going to get inspired and start searching." Brown has discovered or co-discovered a number of objects in the outer solar system, including Sedna and the dwarf planet Eris, which is about the same size as Pluto. These finds played a role in the 2006 reclassification of Pluto to "dwarf planet" — a decision that Brown supports. "All those people who are mad that Pluto is no longer a planet can be thrilled to know that there is a real planet out there still to be found," Brown said. "Now we can go and find this planet and make the solar system have nine planets once again."